Suspecting that a particular protein in tuberculosis was likely to be vital to the bacteria's survival, Johns Hopkins scientists screened 175,000 small chemical compounds and identified a potent class of compounds that selectively slows down this protein's activity and, in a test tube, blocks TB growth, demonstrating that the protein is indeed a vulnerable target. This class of chemical compounds attacks TB by inhibiting methionine aminopeptidase (MetAP), an essential enzyme found in organisms ranging from bacteria to humans, and that clearly has been conserved throughout evolution because of its important task of ensuring the proper manufacture of proteins. 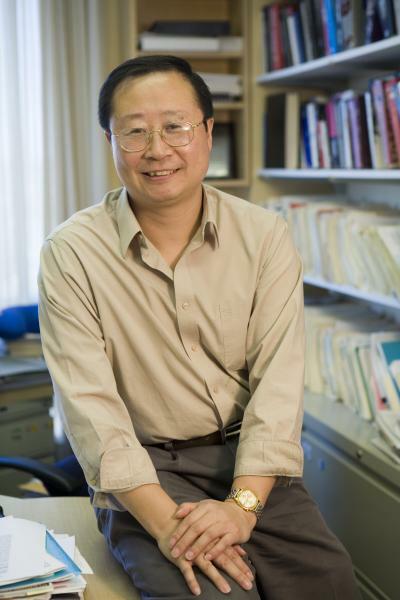 "The MetAP inhibitors we discovered are hits, or leads in the sense that they provide a framework — a starting point — for the future development of an anti-TB drug," says Jun O. Liu, Ph.D., professor of pharmacology and molecular sciences, Johns Hopkins University School of Medicine. The research appears in the January 29 edition of Chemistry & Biology. The scientists cautioned that although the MetAP inhibitors prevent TB growth in test tubes, they have a long way to go before being declared safe and effective to treat TB patients. To understand how the MetAP inhibitors work, Liu suggests thinking of proteins as a strand of pearls folded in unique 3-D shapes, with each bead representing a protein building block, or amino acid. Invariably, the first bead, or amino acid, in every string, whether human or bacterial protein, is a methionine. The methionine ultimately needs to be removed in order for the protein to mature and fold correctly. Its removal is the job of enzymes called methionine aminopeptidases, or MetAPs. "If you knock out this enzyme in TB bacteria, the bacteria will not survive," Liu says. "We expected that would happen, and confirmed it by manipulating how much enzyme is expressed to see what happens to the sensitivity of the bacteria when inhibitors are present." What caught the team by surprise, however, was finding a potent class of compounds (called 2,3-dichloro-1, 4-naphthoquinone) that inhibits this enzyme. That discovery involved the use of large-scale, high-throughput screening of 175,000 compounds and measuring the potencies of a dozen related hits against the enzyme. The final experiment by the team was to test the MetAP inhibitors on TB bacteria in culture to see if it had any effect on bacteria growth. "Judging from potency, a MetAP inhibibitor alone probably won't wipe out TB," Liu says. "TB is so hard to treat that the standard therapy involves a cocktail of multiple drugs; no single compound is powerful enough. Our hope is that someday an inhibitor of MetAP will become a new component to enhance the existing therapy." In addition to Liu, authors of this paper are Omonike Olaleye, Tirumalai R. Raghunand, Shridhar Bhat, Sandeep Tyagi, Gyanu Lamichhane, Peihua Gu, Jiangbing Zhou, Ying Zhang, Jacques Grosset, and William R. Bishai, all of Johns Hopkins.